• Member of the “EFAS” Scientific Comitee. • 1964-1972. Escoles Pies Sarrià. Barcelona . España. • 1980. Licenciado en Medicina y Cirugía. Universidad de Barcelona. • 1981-84 Médico Residente. Servicio de Traumatología y Ortopedia. Hospital Mútua de Terrassa. • 1977-1992 Miembro activo del Equipo del Prof. Antonio Viladot siendo su Asistente Personal durante este periodo. • 2006. Fellowship en Arizona (USA) con el Dr. Stephen Barrett (PMD). Cirugía del pie diabético y Cirugía Endoscópica. • 2012 (Febrero): Stage con L.S & P. Barouk, orientado a la Osteotomía de Scarff y Cirugía mínimamente invasiva del gastrocnemio. IDIOMAS Español, Catalán, Inglés, Francés, Italiano. 1976-1979 : Intern student in the Department of Orthopedics and Traumatology Clinic of Santa Fe de Sabadell. 1979-1981 : Volunteer Medical Assistant in the Department of Orthopaedic surgery in Hospital de Sant Rafael , Barcelona (Prof. A. Viladot Pericé). 1976-1979 : Center for Experimental Surgery of the “Mutual Sabadellenca” in active participation in many works performed at this center. 1980-1981 : Assigned to the Service of Traumatology and Orthopaedics of the “HOSPITAL MILITAR DE ZARAGOZA” (Military Service). 1981-1984: Medical Resident opposition Service by Trauma and Orthopaedics “Hospital Mutua de Terrassa”. 1982 -1992 : Active member of the team Orthopaedic Surgery and Traumatology , Prof. Antonio Viladot Pericé .”Clínica Tres Torres” , Barcelona. 1984 – 2005 : Member of the Service of Orthopaedic Surgery and Traumatology of the “Hospital General de Catalunya”, Sant Cugat del Vallès, Barcelona, Spain. 1985-2003: Responsible for the care of Pediatric Orthopaedic area and Neonatal, “Hospital General de Catalunya”, Sant Cugat del Vallès, Barcelona, Spain. 1985-2003 :Responsible of Foot and Ankle surgery Unit. “Hospital General de Catalunya” ,Sant Cugat del Vallès, Barcelona, Spain. 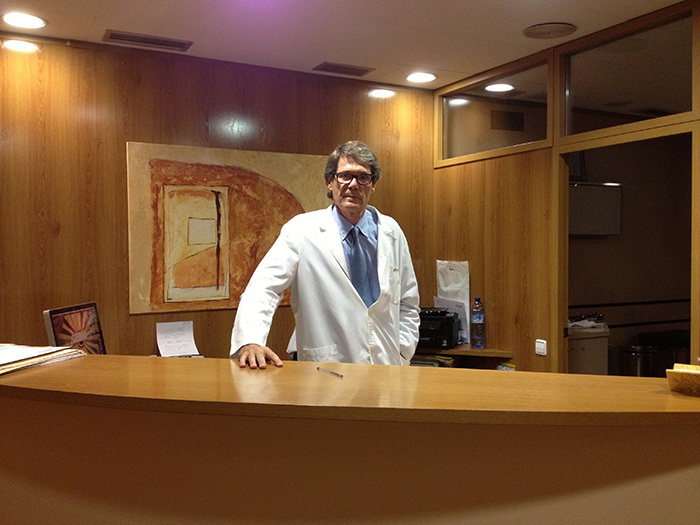 2003-2007:Head of Foot and Ankle Surgery Unit.” Hospital General de Catalunya” ,Sant Cugat del Vallès, Barcelona, Spain. 2003-2007: Head of Newborn and Children Orthopaedics Unit. “Hospital General de Catalunya” ,Sant Cugat del Vallès, Barcelona, Spain. 2005- 2007:Head of Orthandopaedic and Traumatology Surgery Service. “Hospital General de Catalunya” ,Sant Cugat del Vallès, Barcelona, Spain. 2005-2007 : Responsible of the Foot & Ankle Endoscopic Surgery Unit.” Hospital General de Catalunya” ,Sant Cugat del Vallès, Barcelona, Spain. • President of the Scientific Comitee of G.R.E.C.M.I.P. • Responsible of International Relationships of G.R.E.C.M.I.P. • Member of “Group de Recherche et d’Evaluation en Chirurgie Mini Invasive du Pied” (G.R.E.C.M.I.P). • Member of Group TALUS , dedicated on foot and ankle surgery in the Group d’Études pour la ChIrurgie Osseuse (G.E.C.O). • Member of Editorial board of the “Revista española de cirugia de pie y tobillo” and “Boletin de la Sociedad Española de Pie y Tobillo”. • Member of “Academia de Ciències Mèdiques de Catalunya i Balears”. Since 1975. • Member of “Sociedad Española de Cirugia del Pie y del Tobillo.”(S.E.M.P.T).Since 1980. • October 2006: Theoretical-Practical Course “Endoscopic Foot Surgery”. International University of Catalunya (UIC)-Hospital General de Catalunya(HGC),. • 2012 Director and chairman of the “Advanced Forefoot Integra international course. Issues, complications and solutions “ in Hospital Quirón Barcelona 27-28 September2012. • Since 2007 as a member of GPT-FAC-BCN , training of Orthopaedic Surgery especialists (fellowships) in Mini-invasive surgery of foot and ankle. Recibimos Fellows de todo el mundo, especialmente de Sudamérica, Europa, Suiza, España, Marruecos, etc. • May 2006: Speaker. “28th National Congress of the Spanish Society of Medicine and Surgery Foot and Ankle (SEMCPT) Spanish-American Congres.”(Córdoba, Spain). • “Correction of equinus by endoscopic gastrocnemius lengthening” .• “Treatment of plantar fasciitis by Fasciotomy Endoscopic subtotal”. • “Treatment of Morton’s neuroma by Endoscopy: Endoscopic Section intermetatarsal ligament. Barrett technique”. • December 2006 : “Journee d´hiver”, Societé Francaise de Medicine et de Chirurgie du Pied. (École du Val-de Grace.Paris). • “Plantar fasciitis: Endoscopic Plantar Fasciotomy, our experience in more than 50 cases”. • “Endocopic decompression of Morton’s neuroma”. • “Endoscopic gastrocnemious-release in association with surgery of flat foot Kallix endorthesis (surgical note)”. • “Treatment of chronic plantar fasciitis with Fasciotomy Endoscopic subtotal. Our Partner-Review first 50 cases”. • “Primary osteoarthritis central Lisfranc joint. Review of treatment by selective arthrodesis”. • February 2008: Speaker.“Cursos Prácticos sobre Técnicas actuales en Cirugia del Pie”. • “Fascitis plantar. Espolon calcáneo.Tratamiento percutáneo y endoscópico”. • Hallux Valgus round table. • “Alargamiento endoscópico del gastroecnemio, resultados depués de tres años de experiencia”. • Poster ”Quiste sinovial intraóseo afectando el maleolo interno y la articulación del tobillo”. 2000-2001:Teaching Assistant professor.Diploma of Physiotherapy. Universitat Internacional de Catalunya (UIC). Lectures:The Diabetic Foot in Orthopaedic Surgery. Miscellaneous. 25 abril 2008: Professor “Master Universitario en Traumartologia del deporte”. Universitat de Brcelona. (UB) Lecture:”Pie y deporte”. Free communications :“Tratamiento de la ruptura aguda del tendón de Aquiles mediante sutura minimamente invasiva asociada a un alargamiento endoscópico del gastrocnemio”. “Tratamiento de la fascitis plantar mediante Fasciotomia parcial Endoscópica”. May 2009:Professor “Curso de Enfermedades de los pies A. Viladot”. Curso Doctorado Universidad Barcelona(UB). September 2009. Faculty “3d International Live Arthroscopy Festival”.(Portoroz. Eslovenia.) Live surgery”Morton Neuroma.Endoscopic treatment”. Sept 2009: Enseignant et maitre de stage“Cours Annuel de chirurgie mini invasive du pied et la cheville” (Bordeaux .France) GRECMIP“Chirurgie percutanée de l’avant pied. 5ème rayon”“Endoscopies articulaires et extra-articulaires du pied”. Lecture:“Algoritmo de tratamiento del Hallux Valgus”. Session,Lecture,Table ronde:“Actualites sur le tendon calcaneén”. “Classification et indications de la maladie de Morton pour le traitement chirurgical MI (mini-invasive)”. “Classification et indications de la maladie de Morton . Traitement chirurgical Endoscopic”. “Fascitis plantar .Espolon calcáneo-Tratamiento percutáneo y endoscópico”. 8th International Congress of the EFAS”( Genève, Switzerland). Lecture :“Fascitis plantar.Espolon calcáneo-Tratamiento percutáneo y endoscópico”. May 2011: Faculty and member of the organizing committee. “Jornada de complicaciones en cirugía de pie y tobillo” Director: P. Fernandez de Retana. Organized by Prof. Francesco Cancilleri, Prof. Paolo Ronconi – Docenti nella scuola di specializzazione di Ortopedia e Traumatologia dell’Università Campus Bio-Medico di Roma . “Endoscopic procedures in Morton, Plantar Fasciitis and Gastrocnemious lenghtening”. (Directors Dr. Pau Golanó and Olivier Laffenettre) Cours Theoretical and Cadaver lab. Responsible of a students group and “maître d’estage”. “Endoscopies articulaires et extra-articulaires du pied”. As a faculty with presentations on “Hell Pain”, “Quintus Varus” and responsable of a student group and “maitre d’ estage”. “Cours Annuel de chirurgie mini invasive du pied et la cheville” (Bordeaux .France) GRECMIP“Chirurgie percutanée de l’avant pied. 5ème rayon”“Endoscopies articulaires et extra-articulaires du pied”. March 2014: Faculty.Germany Minimal Invasive Surgery. Münster 27-03-2014“MIS Surgery Complications”“Distal Metatarsal Minimal Invasive Osteotomy. April 2014, 24th-25th .“INTEGRA. Foot and Ankle Surgery. The first steps”. As al Faculty Speaker and Co-director of the Course. May 2014:“45º CURSO DE ENFERMEDADES DE LOS PIES” as a Faculty. EFFORT SYMPOSIUM as a Invited Speaker. “Adult Flat Foot: Indications of Arthrodesis”. Congreso de la Sociedad Española de Cirugía del Pie (SECMPT) as a Speaker in the Round Table. “Heel Pain Meeting” Hospital Quirón Barcelona. “International Meeting as a Director and Speaker in many of the lectures”. 6th International Foot and Ankle Minimally Invasive Surgery Course. September 2014: 13ème. Course annuel de Base du GRELMIP. Bordeaux 17-18-19 Sept.
“DMMO – Allongement endoscopique des Gastrocnemiens” Techniques operatoires. “Syndrome de Morton” Technique e indications. October 2014:“10th EFAS INTERNATIONAL CONGRESS”. Barcelona. Spain. Round Table MIS and Open Techniques in the forefoot. October 2014: “Symposium de Pie y Tobillo. Dr. Jordi Asunción”. November 2014: EFORT INSTRUCTIONAL COURSE. 28-29 Nov. Lausanne. SW. “Live Surgery. Percutaneous Chevron”. February 12-13, 2015:“III Jornadas de Pie y Tobillo (Dr. J. MURIANO y Dr. A. PÉREZ).As a Faculty Speaker: “Fascitis Plantar – MI Opción Quirúrgica”. June 2015:“INTEGRA MINIMAL INVASIVE FOOT SURGERY. COURSE DIRECTED BY DR. MARIANO DE PRADO. 25-26 June. MADRID. SPAIN”. July 2015:“4th INTERNATIONAL CONGRESS OF FOOT AND ANKLE MINIMALLY INVASIVE SURGERY”. 2-3 July, 2015. Barcelona. Spain. Round Table: Gastrocnemius Recession: Endoscopic Lengthening. Dr. E. Rabat, Dr. C. Paressant, Dr. O Laffenettre. September 2015:“14ème. COURS ANNUEL DE BASE DU GRECMIP”. 16-17-18 Septiembre 2015. BORDEAUX. FRANCE. As a “Conferencier”:Chirugie Percutanèe du 1ère. rayon: SCARF PERCUTANÈ.Syndrome de MORTON: Technique et indications.WorkShop cas cliniques. November 2015:“Técnicas quirúrgicas y Vias de abordaje en Cirugía de pie y tobillo”.Curso Superior Universitario. Director: Dr. XAVIER MARTIN OLIVA.As a Faculty Speaker: “Talalgias”. December 2015:“EFAS ADVANCED SYMPOSIUM”.Difficult Scenarios and Controversias. 4-5 December, 2015. GENOA. IT. “Chirurgie mini-invasive et percutanée du pied”. Ed.Sauraps Medical Chapter 16: Traitement percutanée des deformations du 5eme rayon. E.Rabat et O.Laffenetre. “20 lecciones sobre patologia del pie”. A. Viladot Voegeli.y Ramon Viladot Pericé. Ed Mayo. “Gastrocnemio Corto. De la Anatomía al tratamiento”. Ed. Sauramps. “Arthroscopies et endoscopies de la cheville et du pied”. GRECMIP. Ed Sauramps Medical. Traitement endoscopique du Sindrome du Morton. “Arthroscopies et endoscopies de la cheville et du pied”GRECMIP. Direction Scientifique Dr. Thomas Bauer et Dr. Olivier Laffenettre. Dècompresion endoscopique de l’espace interdigital dans le Syndrome de Morton. Dr. E. Rabat. Dr. F. Ismael. Dr. R. Viladot. E. Rabat. F. Ismael. P. Golanó. Dirección: Dres. L.S. & P. Barouk. Sauramps Medical 2012. Ediciones en Español y Francés. Ostheotomies distales percutanèes du premier rayon: chevron et scarf avec materiel d’ostéosynthése. Pág. 159. Dr. E. Rabat. Dr. M. Del Prado. Chapitre 13: Metatarsalgies Latèrales, Pathologie Du Cinquième Rayon. Pag. 240. Osteotomie Distale Percutanèe des Metatarsiens Lateraux (DMMO). M. Del Prado. E. Rabat. Chapitre 15: PATHOLOGIE DES ORTEILS: CLINIQUE ET TRAITEMENT CHIRURGICAL. Pag. 315. Traitement Percutanèe des deformations des Orteils Latèraux. Pag. 329. For the Lower Extremity Surgeon. Editor: Stephen L. Barret, DPM. E. Rabat. J. Vega. P. Determe. Chapitre 133: “Traitement endoscopique de la Fasciitis Plantaire” Pag. 1315. ”The growth of the first metatarsal bone”. Foot Ankle. 1980; 1(2): 117-122. Rochera R, Rabat E.
1College of Health Sciences, Midwestern University, Glendale, USA; 2Hospital Quiron, Barcelona, Spain; 3Private Practice, Houston, USA; 4Private Practice, Midland, USA; 5College of Health Sciences, Midwestern University, Glendale, USA. Monographie AFCP nº9 :Journée de Spécialités. SOFCOT 2013.